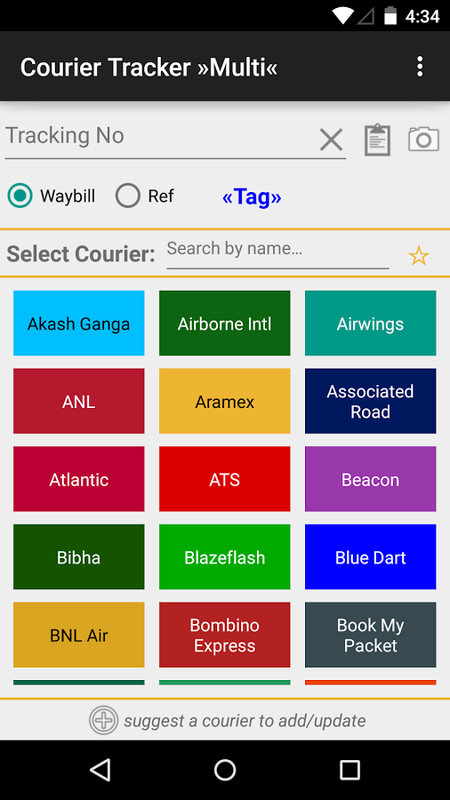 In This Multi Courier Tracker Application They have added ONE HUNDRED AND EIGHTY FOUR popular courier services in India and around the world so you have all courier related information on your finger tip. SMART PASTE: In this application you can paste text directly from an SMS or email – even an entire message, or a link – and the tracking number will be searched for and pasted in application without any problem. MAGIC STAR ‘★’: This feature will Bring more frequently used couriers to the top of the list so you can it will be easier to find your frequent courier provider. SAVE & SHARE: Tracking documents may be saved for offline viewing, and directly shared from the app. Please Note: This application works by directing the queries to the tracking sites of the respective couriers. 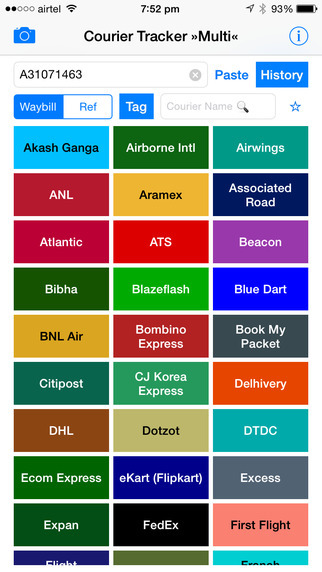 Currently This application is Supporting following courier Providers: 4PX, A-1 International, A3 Express, Air Star Xpress, Air State, Airborne Intl, Airwings, AJ Express, Akash Ganga, AKR Express, Alleppey Parcel Service, ANL, Antron Express, Aramex, Associated Road, Atlantic, ATS, Beacon, Bhavana Roadways, Bibha, Blazeflash, Blue Dart, BNL Air, BOM-GIM, Bombino Express, Book My Packet, BSA Logistics, Bulgarian Post, Canada Post, Central Express, Chips Intl, Chronopost, Citipost, CJ Korea Express, Concorde Express, Courier IT, Daakiyaa, Dakiya, Delex, Delhivery, Delivree King, Delnet Express, DHL, Dotzot, Dreamco Express, DTDC, Ecom Express, eKart (Flipkart), Elbex, eParcel, Excess, Expan, Falcon, Faspeed, Fardar, FedEx, First Flight, Flight Despatch, Flyking, Franch Express, FSC, Gati, GMS Worldwide, GoJavas, Good Luck, ICC World, ICL, ICS, India Post, Infibeam, Inland World, Innovex, International Post, Jaipur Golden, Jetline, JV Express, Kesineni Cargo, Khubani, King World Wide, KourierKonnect, Lalji Mulji, Linex Solutions, Logi Buddy, Ludhiana Express, Madhur, Maruti Air, Max Pacific, Megacity, Megharaj, Metroswift, Mirakle, MML Logistics, my Hermes, Nitco, Nuvo Ex, Om International, Om Logistics, Ondot, Orbit Worldwide, Overnite Express, Overseas Express, Pacific Express, Palande, Parcel Force, Parcel2Go, Parcelled, Parveen Express, Patel Roadways, Pavan, Pick Speed, Pigeon Express, Pionexxco, Poonam, Prime Express, Prime Track, Priority Express, Procure, Professional, Pushpak, Quantium, Red Express, Royal Mail, Safexpress, Satellite Cargo, SCM For You, Sequel, Shree Anjani, Shree Balaji, Shree Laxmi, Shree Maruti, Shree Nandan, Shree Tirupati, Shri Karni, Shri Mahavir, Sigma, Singapore Post, Skycom Express, Skylark Express, Skynet, Skynet India, SM, Snapdeal, Soham International, Speed and safe, Speed Express, Speed Net Express, Speedman Air, Spoton, ST, Steel City, Suntika, Super Trade, Swapnex, Swiss Post, Tanvi Express, Target Logistics, TCI Freight, TCI XPS, Team United, Tej Post, TNT, Total, Trackon, Trust-On, Turkish Post, UBX, UCS, United Cargo, UPS, USPS, V-Express, V-Trans, Vayu Seva, Velex, Vichare, VRL, Vulcan Express, World First, WorldNet Express, Wow Express, Xfas Logistics, Xpressbees, Yanwen Express, Yogayog.